A look at the life of Jorge Mario Bergoglio, form his early childhood days in Argentina to his becoming Pope Francis. The story of Pope Francis' life. A segment of Father Jorge Bergoglio's journey to papecy in a country torn apart by Argentine military dictator Jorge Rafael Videla. 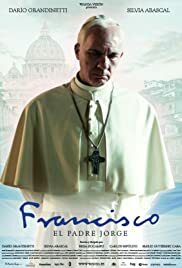 This is an Argentinian film about Fr. Jorge Bergoglio's life prior to Papacy. Based on its simple and straightforward trailer, I am not really expecting too much. However, I still watched the film to learn more about this beloved man and how he rose among the ranks to be the anointed leader of Catholics worldwide. "Papa Francisco" (also called "Francis: Pray for Me" or "Francisco - El Padre Jorge") tells the life story of the Fr. Jorge Bergoglio (Darío Grandinetti) from Argentina, from his boyhood to his election as Pope in 2013. These were told alongside the fictional story of Ana (Silvia Abascal), a agnostic Spanish lady reporter (with an Argentinian mother) assigned to cover the Papal election of 2005. Ana met Padre Jorge when they sat across each other on a train going to Rome, and from then became lifelong friends. The Ana character may have been based on Elisabetta Pique, an Argentine journalist and friend of Padre Jorge, who wrote the biographical book "Pope Francis: Life and Revolution" upon which this film was based. The book was said to be based on interviews on more than seventy people who knew the Pope very well. While individual stories may have read well as a book, but these same stories may also have led to the rather disjointed nature of this film. The film, written and directed by Beda Docampo Feijóo, told the Pope's story in bite-sized episodes, flashing backwards and forwards in time. These scenes just seemed like simple renditions of the highlights of his life, with no effort to connect them into one cohesive whole. There were scenes about controversies, but these were executed with no tension at all. The best example would be this confrontation scene with a lady politician who wanted him to lay off on his crusade against corruption. Padre Jorge says a few eloquent words, and the scene was over, no more follow through on what happens next. There were good episodes, like the one where the young Jorge (Gabriel Gallichio) met a beautiful lady at a wedding reception where they danced the tango, exchanged books and phone numbers. Unfortunately, we never hear of her again after she left on a bus. In fact, that would be the way this film treated most of the other characters from Padre Jorge's past, like his mother or his friends. They were never mentioned again when Padre Jorge was already cardinal. The only exception would be Padre Jorge's book about St. Francis. We saw it given to Jorge by his grandmother when he was a young man, and we would see that book again before he was announced as Pope. Award-winning Argentinian actor Dario Grandinetti plays the senior Padre Jorge. His last film of note was "Wild Tales", an Argentinian film which was nominated for the Oscar for Best Foreign Language Film last year. While he may look sincere, Grandinetti did not really capture the charisma of Padre Jorge. The delivery of his lines were so stiff and lifeless. There was no passion that could be felt nor inspiration that can be drawn from his dry performance. Grandinetti's Padre Jorge did not smile much nor exude warmth, so unlike the person he is portraying. 24 year-old Argentine actor Gabriel Gallichio certainly had more charm in his few scenes as the young Jorge during his student days. This was a simple biographical film with no high artistic aspirations. It was just a plain retelling of various events in the present Pope's lifetime with no unifying concept. This film does not have cinematic artistry nor wide audience appeal of other biopics like "Gandhi," "The Last Emperor," or even "Romero". It would probably appeal only to Catholics who simply want to know more about their present leader. But even with those modest expectations, this uneven film would probably still fall short. With his growing worldwide popularity, I trust Pope Francis will have a better film about him in the future. 5/10.